I thought it would be fun to put together a few Mishloach Manot baskets for Purim, to give you some examples of the types of items that might be included. 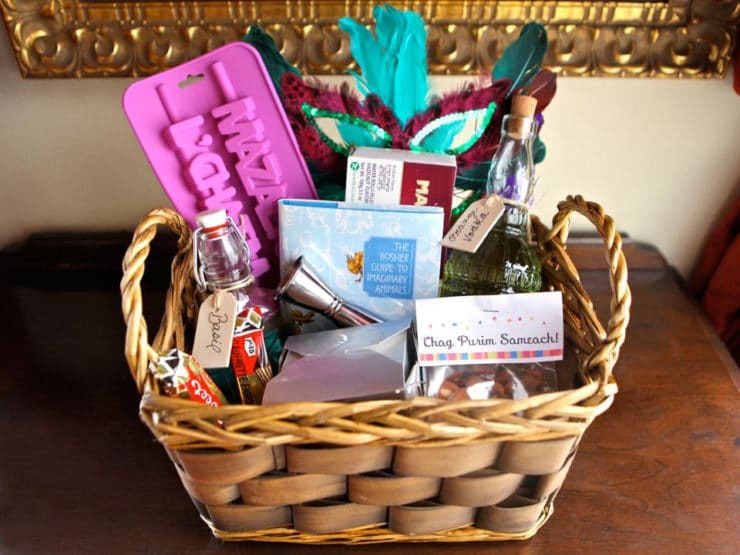 Obviously these are just ideas; with Mishloach Manot, you can really get creative and have fun putting together all kinds of baskets, from simple to spectacular. The only “rule,” really, is to have at least two items that can be eaten in the basket. If you’re making a basket for a family who keeps kosher, you’ll want to make sure that all food items you include are kosher or kosher-certified. Most baskets will also contain some sort of hamantaschen, a traditional cookie for the holiday. Beyond that, the possibilities are endless! This basket would be a great gift for a tea lover, or for somebody who loves to bake. I’ve included some delicious kosher herbal teas, a pretty mug with a tea strainer, homemade hamantaschen with nuts and dates, and a fun book called “The Great Latke Hamantash Debate.” I’ve also included one of our popular Royal Challah silicone baking pans in a small size. They will help the recipient create beautifully shaped challot without the need for braiding, and are particularly helpful for those who wish to make gluten free challah (the dough is often difficult to braid). Links to the products appear below. This basket is perfect for that special kid in your life. It’s filled with all kinds of fun stuff… a colorful children’s book called “Barnyard Purim,” a traditional noisemaker called a gragger, and a cool FunBites sandwich cutter for making mini sandwich bites for school lunches. I’ve filled it out with grape juice, cookies, and candy treats from the local kosher market. You can also stick in some healthier treats like dried fruit and nuts, as long as the recipient doesn’t have a nut allergy. These Mini Mishloach Manot baskets are perfect for bringing to Hebrew school, for kids to give to their friends, and for larger groups where you want to send a small token for Purim. They’ll fit a few hamantaschen and another treat, like candy or dried fruit, in a cute little “basket” package just right for gift giving. Supplies can be found below, including ribbon and tags so you can write a little message to the recipient. 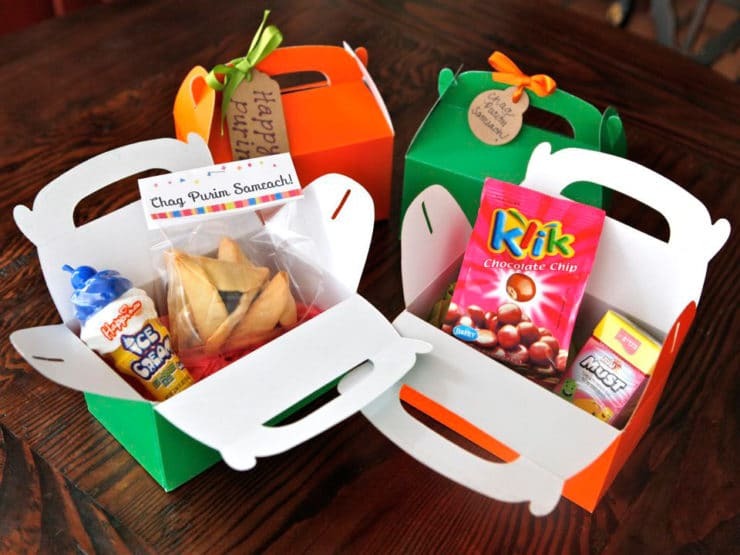 Free printable “Happy Purim!” and “Chag Purim Sameach!” treat bag toppers and instructions can be found at the following link: Homemade Mishloach Manot Baskets for Purim. This Mishloach Manot is designed for giving to “grown up” friends. Drinking is a part of the Purim celebration; the requirement in the Talmud goes so far as to instruct that one should get so drunk that they can’t tell the difference between the phrases Arur Haman (“cursed is Haman”) and Baruch Mordechai (“blessed is Mordecai”). While not everybody participates in this custom, those that do will appreciate the sentiment of this basket. It includes homemade Flavor Infused Vodka and Herb Infused Simple Syrup (follow the links for instructions to make your own). Here I’ve put homemade hamantaschen in a silver Chinese takeout box (you can buy them at the link below). I’ve also added a funny book, “The Kosher Guide to Imaginary Animals” (I reviewed the book here), some cookies, a Jewish ice mold, a jigger for measuring liquor into cocktails, and a mask to celebrate the costumed festivities of Purim. This basket is a beautiful way to show a family that you care. Included are homemade hamantaschen, dates and nuts, herbal tea and kosher coffee, grape juice and kosher treats. It also includes two lovely masks to help the recipient celebrate the costumed Purim festivities. Click here to learn how to make your own paper Mishloach Manot baskets – a great craft for getting kids involved in the holiday fun! I am giving away three of the baskets seen in this post – the Family Fun Purim Basket, the Kid Fun Purim Basket, and the Tea and Challah Purim Basket. Just comment on the site below and let me know which basket you would like to receive, and why. Make sure you leave a valid email address in the email field so we can contact you if you win. 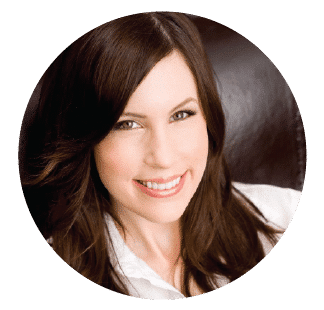 All who enter will be signed up for my free weekly newsletter (if you already receive the newsletter, don’t worry, we’ve got you on file… you won’t receive duplicate newsletters). You can unsubscribe from my newsletter at any time. Winners will be chosen at random. Entries are limited to the continental United States for this contest; if you live outside the U.S., please don’t enter, as we won’t be able to ship the basket to you. So tell me, what’s your favorite basket? Contest ends on Tuesday, February 19 at 5:00pm Pacific. CONTEST HAS ENDED, post is closed to further comments. CONTEST CLOSED! Congratulations to Janet Leigh, Nicola, and Nanette H.! Your comments were chosen via an online randomizer, and you are the winning recipients of the Purim Mishloach Manot baskets. I will be notifying you all via email. To everybody else who entered, thank you for commenting. I will host another giveaway soon! I would love to win the tea and challah basket! A new reader here, I am using your buttery Hamantash recipe this week. Thank you! Anyway, I would love this basket because I recently became a “homemaker” of sorts and have been doing a lot of cooking and baking. Would love that challah pan! 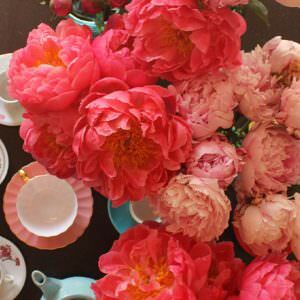 Also am a heavy tea drinker, it is something I like to share with friends. That tea and challah basket is divine! Would love to gift it to my friend who has me over every year. the tea and challah! i love to bake and would have a ton of fun with that pan. Thank you for your many creative, thorough and thoughtful Shiksa In the Kitchen recipes and for offering these creative Purim baskets. Our family of 4 would love to win the Kid Fun Purim basket. My children are ages 2 and 5 and this is the first year we will formally introduce the holiday of Purim in our household. My 5 year old especially is just beginning to take interest in his Jewish heritage, and, living in an area that has very few Jewish families, we really want to show him the fun and festive aspects of our holidays and traditions! I think he would be thrilled to receive a special Purim basket this year. The Kid Fun basket is so precious! The Barnyard Purim book would be wonderful to read to the children. Thank you so much! I love your website and would love to win the tea and challah basket although they all look scrumptious! Chag samech! Thank you for your wonderful blog. You give of yourself each time I am able to read it. What a beautiful soul to want to give on top of that. Thank you for the possibility of winning one of these wonderful baskets. It would be wonderful to win the Kid Fun Basket for my grand-daughter Zoie. I would love the tea and challah basket! As a former Shiksa (recently converted) it would be my first one! I would love to win the tea and Challah basket. I am new to Judaism, and I’m in the process of learning more about the religion, community, and culture with the intent to convert. As part of my spiritual process, and as a complement to my unfortunate circumstance of being laid-off from nonprofit work right now, I spend erev Shabbat meditating, baking challah, writing about the experience and how it relates to my current life situation. More recently, I have started also to give the challot I bake on erev Shabbat to friends and neighbors who are also in need of peace and joy. This act of making and sharing food also brings me peace. I would love the tea and challah basket, so I can continue my work in learning to bake this wonderful bread and sharing the joy of this new journey I’m on. Gorgeous baskets! Would love to win one! My favorite is the challah basket! I have been making challah for my fundraiser that I call Challah for Haiti since I went there as a nurse after the devastating earthquake in 2010. All money I receive for the bread goes toward medical supplies for our free clinics that we continue to provide. I recently tried to fill a request for 100% whole rye challah that certainly did not rise as well as my traditional bread and I think the challah mold would be perfect! I would love to win the Tea and Challah Purim Basket! I bake a LOT, and have wanted a silicone Challah pan for quite some time! I also love hot teas. Everything in the Tea & Challah basket would be greatly used. I love the kids basket and would be thrilled to share it with my grandkids! It is the perfect blend of fun and learning . . I especially love the sandwich cutter and Barnyard Purim! It would be awesome if I received the Tea and Challah Purim basket. I love to bake and every Jewish holiday I bake traditional goodies for my daughter to take to school with her. Her friends all ask her when certain holidays are coming because they count the days until the goodies arrive. The Latke and Hamentashen books looks hysterical and I would love to try some of the recipes (so more people could get a taste). Even though my daughter has one more year of high school, she has already made it known that the “taste of her childhood” needs to come in care packages on a regular basis. It makes me feel loved. I like the L’Chaim basket, all though they are all beautiful! I would like to win one to share with my daughter, she is going through the classes to convert, and just as I did, has found it rewarding, and oh so right! I would share the basket with her and we will make plans to do this ourselves with help from your wonderful marketplace! I think I would choose the tea and challah basket..what a lovely basket! A very tiring but thrilling 6 weeks as I checked off an item of my bucket list, tried out and was 1/6 woman troupe of a Cancer fundraiser play called “Pirates of the Chemotherapy.” Now on March 9th I am donating my curly head of hair for Kids with Cancer at our local St Baldrick’s event. I could ‘really’ use the ‘Tea and Challah’ basket for warmth and comfort for my fellow participants as we will be there all day with newly bald heads. The Kid fun basket is adorable! I am trying to get my 2 1/2 year old son excited about Purim and this looks like such a fun way to do so!! The mother in me says, “this family basket is awesome!” The other part of me is screaming, “boozy goodness, you fool!! !” Love you blog by the way. all of them are beautiful but I really love the tea and challah one! thanks for sharing! The kid fun basket looks great! My kids would be so excited to win that! Forgot to say I would love the Tea and Challah Purim Basket–thanks! I would love the Tea and Challah Purim basket which my husband and I would share with his mother, who is 87 years old and currently hospitalized. I would love the Tea and Challah Purim Basket! It reminds me of Monday morning breakfast in college eating the leftover challah from the weekend with a cup of tea while watching it snow outside. I love all of them but the tea and challah is my favorite! This will be our families first year observing Purim. I am also planning a teaching about Esther for the teen girls in our church, it would be great to serve them tea and challah! Thanks! I love them all but the tea and challah is my favorite! This will be the first year our family will observe Purim. I am planning a teaching, for the teen girls at our church, about Esther, it would be great to make them some challah bread! My family would adore the Family Fun basket – I think my two-year-old would love sharing the treats with her friends! I would love to win the Tea & Challah Purim Basket. I am a huge fan of tea. It perks me up in the morning and always can make me feel better. All of your ideas are so much fun! My daughter would love it if she got the Family Basket in the mail! It would make her Purim! That Tea and Challah basket looks divine! The tea and challah basket is is my favorite. I cannot make a good looking braid! I love the L’CHAIM basket as well with the homemade touches and mask. I would love the tea and challah basket. My daughter, age 14, is going through a period of self-doubt and a sense of disconnect. She and I live in a non-Jewish community (we commute an hour each way for her to attend a confirmation class once per week at the nearest synagogue, 60 miles away). In addition, I am an elementary special education teacher, with spring testing on its way… just a lot going on. The basket would make our next Shabbat even more relaxing, and help her feel the presence of a bigger world beyond our own backyard as we explore special products related to our Jewish faith and culture, that may not be available in our rural middle-of-nowhere. She and I both love tea… and the challah would make a nice substitute for the on-the-go Wal-Mart French bread we usually use. I would be a very happy girl if the family basket found it’s way to my doorstep. I spied my hubby’s fave Elite chocolate bar (we used to call it Red Cow) – he has not had that since we left Israel 10 years ago! There were some things in there that I miss too starting with Te nana….sigh. I would like to win the Tea and Challah basket. I am enjoying learning about Jewish customs and foods. These are great ideas. I would love to win the Family Fun Basket because it contains something to be enjoyed by every member of the family. I would like the Tea and Challah Purim Basket. Tea and challah would be be divine. The pretty mug with tea strainer looks especially fine! The “Tea and Challah” basket is so charming. It’s just waiting for good friends to get together and chat over a hot cup of tea. So colorful & inviting…love all of the Israeli products! Thanks for sharing your ideas. One theme that I did once was “salad”…all of the fixings for making and serving a salad were in a colorful salad bowl…it was a big hit. Chag Same’ach! I love the family fun one. I teach at a day school and we are busy making our baskets, sometimes I forget about the family and they miss out. I would love to win any of these amazing mishloach manot to share with my family and help teach my kids about this fun mitzvah. I love your Facebook and emails. Shiksa, you rock! 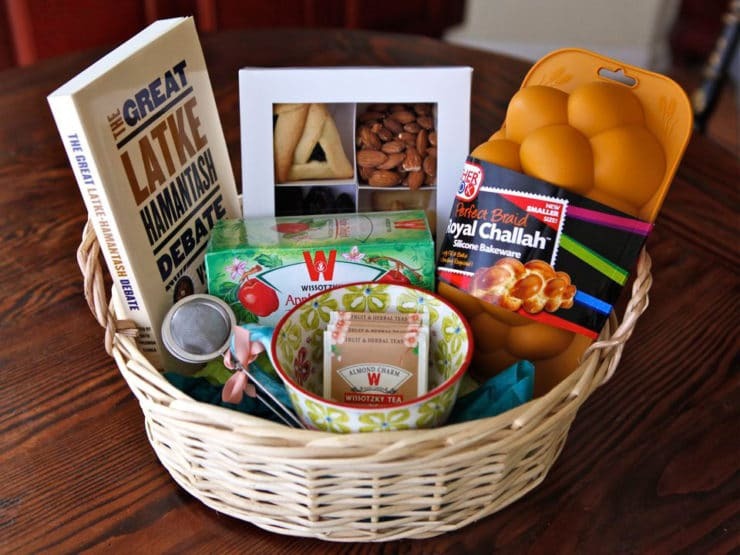 I love that La Chaim basket because I would enjoy celebrating with everything in it! These mishloach manot baskets are very creative. I use to make such baskets during high school for Homecoming. 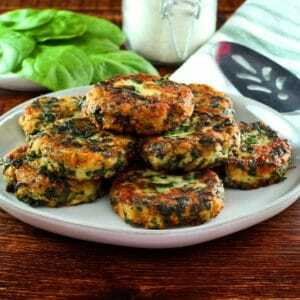 I would love to make these for my neighbors who are Jewish and keep kosher. I would love to win the Family Fun Purim Basket. I am a born and raised Catholic girl who read Marjorie Morningstar when young and I have been interested in the Jewish faith ever since. I have learned a lot from you! I the idea of the baskets. If I were choosing for me, I’d choose the tea and challah basket because I drink a lot of tea and have a special Anthropolie mug I use and I love the mug in the basket. Also, I want to try your Hamantaschen! They all look yummy to me. 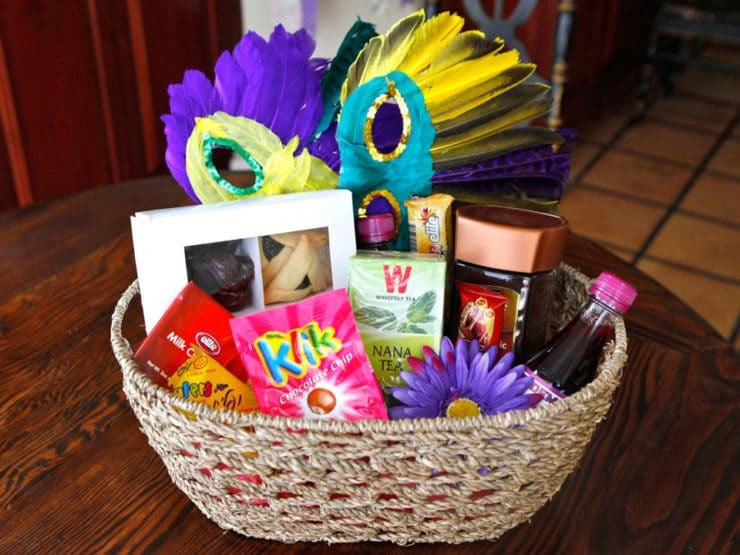 Love the L’Chaim Purim Basket. All of the baskets are great ideas. I would like to win the Tea and Challah Purim Basket to give to my wonderful daughter-in-law who is a school teacher. She loves to bake for her husband and three children. This would be a perfect gift. A cup of tea and a good book for her. Oh my! They all look wonderful, but since I love tea and love to read, the Tea and Challah would be my choice. Thanks. 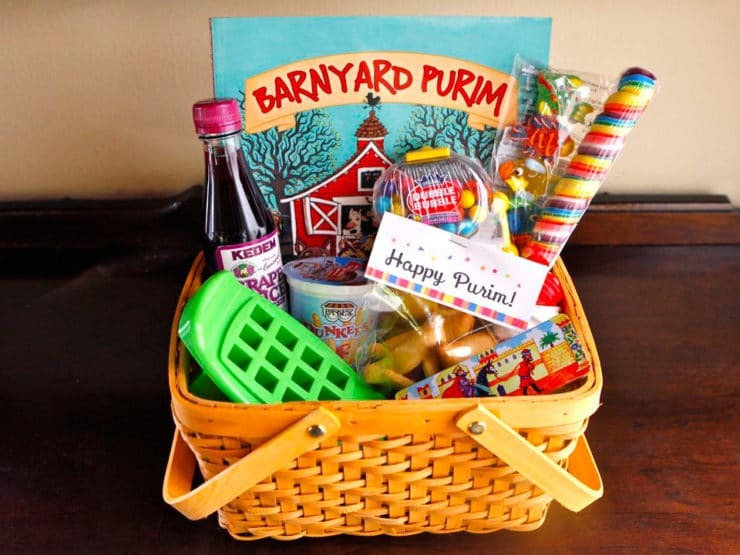 i would love the family fun purim basket to share with my granddaughter.She went to the yeshiva til 8th grade she is now 17 and misses being in that school it would be nice to enjoy it together…they are all lovely ! !